Digital (or Social) Selling is fast becoming a topic that B2B businesses are adopting, from humble start-ups to global enterprises. LinkedIn is the linchpin when it comes to connecting and building professional relationships online - not surprising given it has over 560 million users in more than 200 countries and territories worldwide. However, since I first started training around the topic of Social Business (around 2010) and the Microsoft acquisition of the LinkedIn (2016) I've witnessed several iterations of the product. Primarily the fact that Basic is becoming more 'basic' and premium LinkedIn products (that you have to pay for) are becoming more, well, more premium! 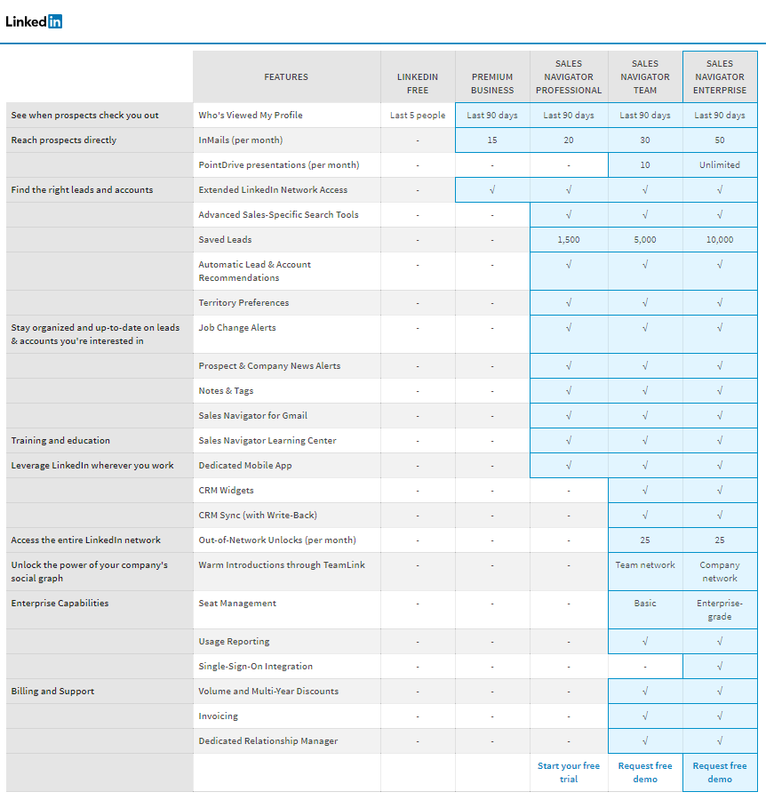 The reality is, LinkedIn has realised the potential of what it owns and is charging handsomely for it. But, is it really worth the money? Short answer, yes. However, as I have written before, don't be mistaken into thinking the tool is the answer. The tool is only as good as the user which means you need to invest in training to make sure you embed this new way of selling. We cover this in our blog '3 Ways To Get The Most Out Of Your Sales Navigator Investment'. 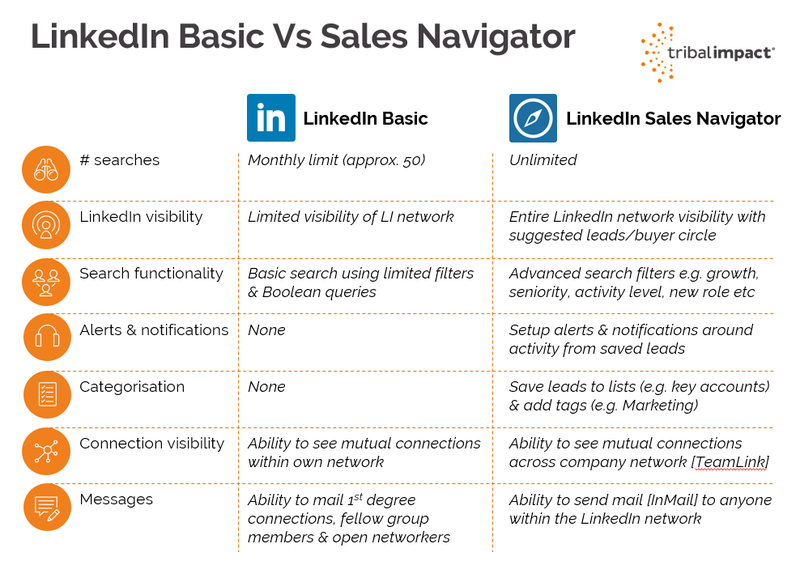 So, what's the difference between LinkedIn Basic and LinkedIn Sales Navigator? Basic will limit how many member searches you can do and it isn’t many. After you reach the limit it will keep showing you a pop up message suggesting you upgrade. Sales Navigator won’t do this as you get unlimited searches. Basic will limit your member search landscape. It will show you approx 100-150 member results which means you won’t be seeing all of the people that matched your search criteria. Sales Navigator enables you to access the entire LinkedIn member database. Whilst you can use Boolean searches in LinkedIn Basic it will show you the limited results only (as above). It will also restrict your view on the behaviour of those members. One of the most valuable features of Sales Navigator is that it allows you to filter searches further so you can identify those who have changed jobs in the last 90 days or those who are already actively sharing/engaging on LinkedIn. This enables your sales reps to identify those that are easier to reach and nurture through the platform. No more cold calling! LinkedIn basic will identify people as 1st, 2nd and 3rd degree connections. The means that you can see mutual connections and possible referrers into an account. A key feature of Sales Navigator Team is TeamLink - it basically does the same thing but within your company. 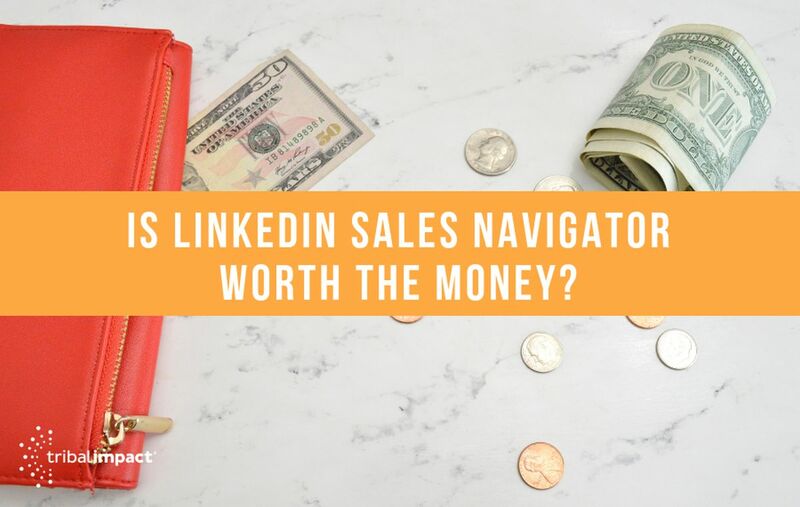 So, a business development rep within your company can see who else within the organisation (who has a Sales Navigator license) can introduce them to a target prospect - even though those employees aren't directly connected to each other on LinkedIn! Basic once had an option for tagging but it was removed a couple of years ago and placed exclusively in the Sales Navigator product. You can list your saved leads using identifiers e.g. Customers, Prospects, Customers up for renewal within the next 3 months - whatever you choose. It's not there to replace your CRM system but it does allow you to filter quickly on listed contacts. Basic will allow you to view the last 5 people who looked at your LinkedIn profile. Sales Navigator will provide a view of all those checking your profile in the last 90 days. This is very helpful if you want to see if your content sharing is reaching your target audience. LinkedIn basic will provide you with a newsfeed of updates from all of the people you're connected with and hashtags you are following. It can get very messy. But, it's all about timing. Sales Navigator allows you to only save the people you most care about as leads - could be customers, prospects and competitors (a bit like lists in Twitter) so you target your time at the people you most care about including prospects, customers, influencers and even competitors! More than that it then allows you to filter further to see shared content from those saved leads, or mentions in the news. Another feature that only exists in Sales Navigator is Lead & Account Recommendations. Based on the people you're already saving and the searches you're making, LinkedIn will begin to recommend other leads that you might be interested in e.g. same seniority level or division. We know from experience that identifying the buyer circle earlier on can decrease time to deal closure. This is another powerful feature you cannot get in Basic. Alerts and notifications via your mobile provide a quick and efficient way to be notified when your leads are active e.g. sharing content, changed jobs or have even been mentioned in the news. Spoiler alert: I don't sit for hours in Sales Navigator each day. In all honesty, these are the alerts which drive my behaviour into the Sales Navigator product. It's about being smart with your time! With Basic you can message connections and fellow Group members (up to 15 a month). With Sales Navigator you get a quota of InMails each month allowing you to message non-connections. Perfect for event invitations and well researched outreaches. However, be careful not to use this as a replacement for cold calling. In our experience, companies are only just starting to realise the benefits of this feature. PointDrive allows users to create content portals that sales can share with prospects. This is ideal for companies that can't easily host content in a place that tracks who is looking at it. Check out this blog about using PointDrive for sales. Check out the comparison chart below to fully understand the different capabilities. You can then start a free trial via the LinkedIn website here.